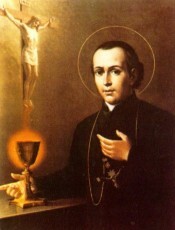 St. Gasper was born in Rome, on January 6th, 1786. His father was a servant for the family of a Prince. He was a pious man of strong faith, and was a strong defender of the Holy Father. His mother new at an early age, that Gasper was destined for great things. Gasper showed a deep devotion for the Blood of Christ at an early age, and had a great concern for the poor and sick. This compassion consumed him, and he spent his summers visiting hospitals and bringing meals to the hungry. He and some of his classmates ministered to the peasants from rural areas that came to Rome to sell their hay. He provided catechism for orphans and children of the poor, and set up shelter for the homeless. St. Gasper was ordained July 31, 1808. Less than a year later, Napoleon suppressed the Papal States. Pope Pius VII was arrested. Gasper was brought before the magistrate to take an oath of allegiance to the emperor. He did not denounce God, and was sentenced to prison. His body was incarcerated, but the truth had set his spirit free. During his exile his compassion deepened. Though he had been about works of mercy most of his life, in the silence of his cell this work was clearly defined by the Precious Blood of Christ. In the solitude of exile, the vision became clear. He would join with others, bound in charity, to touch others with the redeeming grace of the Blood of Jesus. Napoleon was defeated in January 1814, and Gasper was free to return to Rome to begin his mission as an Apostle of the Precious Blood. Because of Napoleon’s reign, Rome was in disarray. The Pope appointed St. Gasper to preach missions throughout the city and the surrounding countryside for the spiritual renewal of the people. He set out to begin his apostolic life. St. Gasper founded the Society of the Precious Blood in Giano, Italy in August 1815. The preamble of the C.P.P.S. constitution captures this new beginning, “Impelled by the love of Christ, manifested especially in the shedding of His Blood, and sensitive to the needs of the Church”. St. Gaspar del Bufalo founded a priestly institute. He attracted from the diocesan clergy a group of like-minded priests and united them by a bond of charity, instead of vows. They lived together in mission houses, and were a great source of renewal for priests and the faithful, as they preached missions and retreats. It was St. Gasper’s vision to wed the spirituality of the Precious Blood with the concept of a community for the apostolic works of mercy. This sacred union gave birth to the Society of the Precious Blood that would proclaim “Peace through the Blood of the Cross”. St. Gasper was known for bringing the Blood of Christ out of the Sanctuary, and into the Streets. His preaching was rooted in the saving act of Christ on the cross and so he carried the crucifix close to his heart. This cross became the symbol of the newly formed community. He began to lift the burden of sin from the hearts of his listeners. In 1821 the Papal States were in disarray. They were under the control of the bandits; it was a time of lawlessness. Cardinal Cristaldi was a great admirer of St. Gasper. He was also the papal treasurer, and advisor to Pope Pius VII. He had a plan to fight these evil forces not with weapons, but with spiritual forces. He wanted St. Gasper and his missionaries to go into the local towns and establish mission houses, among the bandits themselves. They were to preach the Word, establish Churches, and instruct the people. This is what the Society did between 1821 and 1823. During this time, six new mission houses were opened. Each house was to have five missionaries, and each team would conduct twelve missions a year. This was to ensure everyone would hear the redemptive message of Christ. Armed with only a crucifix, they went into the hills to seek out the bandits, and won them over. The plan worked, and in less than two years, the problem was under control. He was well loved and to this day, he remains a popular saint to his native city, as well as a popular hero in Rome. St. Gasper died on December 28, 1837. The medical report called him a “Victim of Charity” because even though he was in ill health himself, he ministered to the victims of the cholera epidemic that broke out in Rome. St. Gasper was beatified in 1904, and canonized on June 12, 1954. The Society of the Precious Blood has several Provinces in the United States that remain active today. St. Gasper had a profound love for the redemptive Blood of Christ. Even at an early age, he came to know of the overwhelming love of God for us, by allowing His Son’s Blood to be shed for our sins. He was imprisoned by Napoleon when he wouldn’t denounce God and pledge his allegiance to him. For four years in prison, he became even more devoted to the Precious Blood of Christ. He was ordained, and started the Missionaries of the Precious Blood. His Society has several Provinces in the United States; one is the Province of Dayton, Ohio. They operate and staff the Sorrowful Mother Shrine in Bellevue, Ohio, and have since they started it in 1860. It is the oldest Shrine east of the Mississippi River, in the United States, and continues to be operated and staffed by the Missionaries of the Precious Blood. The Precious Blood of Jesus is our redemption, and St. Gasper was well aware of that. He did all he could to preach that as a missionary, and in his retreats.